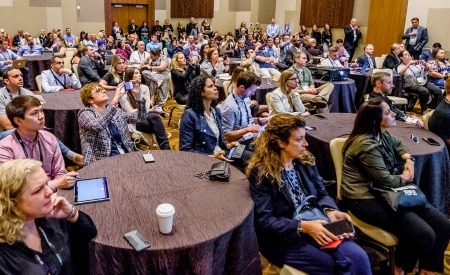 The HCM technology conference formerly known as HR Tech World reintroduced itself as UNLEASH America last week, bringing to Las Vegas a “less-is-more” dynamic that both attendees and exhibitors said emphasized discussions over product demos and offered buyers the opportunity to spend more time exploring solutions that might interest them. This was the type of response the people behind UNLEASH were looking for, according to China Gorman, the organizing company’s U.S. managing director. She described her team’s approach to producing the show as “curating,” with an eye toward gathering the right attendees—decision-makers, high-level influencers and forward-looking HR technology vendors—rather than host a larger crowd with an uncertain level of influence. Approximately 1,500 people attended the conference, including 115 presenters and representatives of 100 exhibitors. Companies in the hall ranged from brand names like SAP SuccessFactors, Ultimate Software, Workday, LinkedIn and IBM to smaller firms such as recruiting platform provider Gr8 People, based in Newtown, Pa.; Codefights, a San Francisco developer of assessment and recruiting tools; and beqom, a cloud-based compensation management solution whose North American office is in Southport, Conn.
For a first-year exhibition, UNLEASH America went off smoothly although there was a certain “kick-the-tires” feel to it. Many of the HCM tech community’s bigger players held back from exhibiting, including Oracle, ADP, Paychex and Saba. Oracle and Monster had representatives on the attendee list, though we noticed Kronos, Paychex and Willis Towers Watson didn’t have any kind of presence. However, by the time spring began some of these same companies had committed to sending presenters, exhibit teams or both. “The more we looked at who was going, the more we thought it was worth attending,” said another vendor. “Our gut feeling is that we can build on our strengths for next year,” Gorman told HCM Technology report after the conference. “We expect to have a larger expo and expand our start-up ecosystem, [present] additional diverse senior speakers and scale the event with even more attendees.” She said feedback from attendees, sponsors and exhibitors has been “extraordinarily positive,” and so far we’ve yet to some across anyone who had particularly negative reaction. 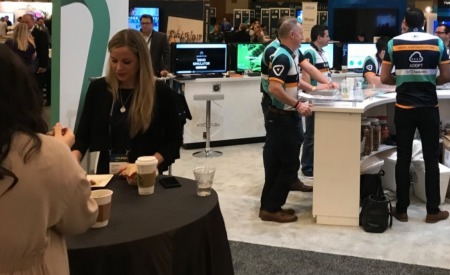 Ultimately, UNLEASH aims to build the North American event to the level of its annual conference in Europe, which has a heavy presence of executives and purchasing decision-makers. Our feeling is 2019’s event will see more attendees and a busier exhibit hall. Just how much bigger it will be undoubtedly depends on the returns exhibitors see from 2018.